New Zealand craft beer-maker Behemoth Brewing has launched a new beer with a name worthy of Best Beer HQ’s best beer names list. According to the craft brewer, ‘Hopped up on Pils’ combines the crispness of a good pilsner, with the hops of an IPA. At 5% alcohol per volume, it’s a balanced and very easy-drinking beer with orange and tropical notes. It features Motueka and New Zealand Cascade hops, mixed with NZ pilsner malt, as well as lager yeast from Mangrove Jacks. 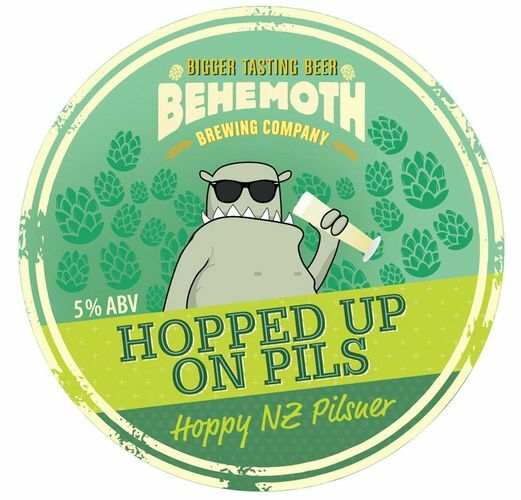 Behemoth Brewing founder Andrew Childs said Hopped up on Pils will deliver plenty of flavour and aroma, without the bitterness that beer drinkers would normally associate with an IPA or pale ale. Hopped up on Pils is the third beer in Behemoth Brewing’s range of bottled craft beers. At the time of writing, the company also brews Chur New Zealand Pale Ale and ‘Murica APA. Behemoth’s new beer is available from mid-November 2014 in 330ml and 500ml bottles, as well as on tap at Auckland brew bar 16 TUN in Wynyard Quarter. Best Beer HQ has already been in and tried Hopped up on Pils, and we’re pleased to say that the beer is worthy of the marketing hype – it’s an incredibly drinkable pilsner, well balanced and more-ish. It’s a nice beer for drinking in the sun, or drinking on a rainy day in Auckland – as I did – wishing it was sunny. We look forward to drinking what Behemoth Brewing comes out with next. A passion for beer brewing made Wellington man Andrew Childs abandon a career in law and focus on doing what he loved most: brewing beer. After working at home brewing company Mangrove Jack’s for a time, he formed Behemoth Brewing in 2013. Behemoth has already won some critical acclaim for its beers: it received a gold medal at the 2014 New Zealand beer awards for both its Chur NZ pale ale and its ‘Murica American pale ale. Meanwhile, Behemoth also received a Best in Class trophy at Beervana for its Brave Bickie Brown Ale – which was like an ANZAC biscuit in beer form, complete with oats, golden syrup and toasted coconut. That sounds very interesting indeed.